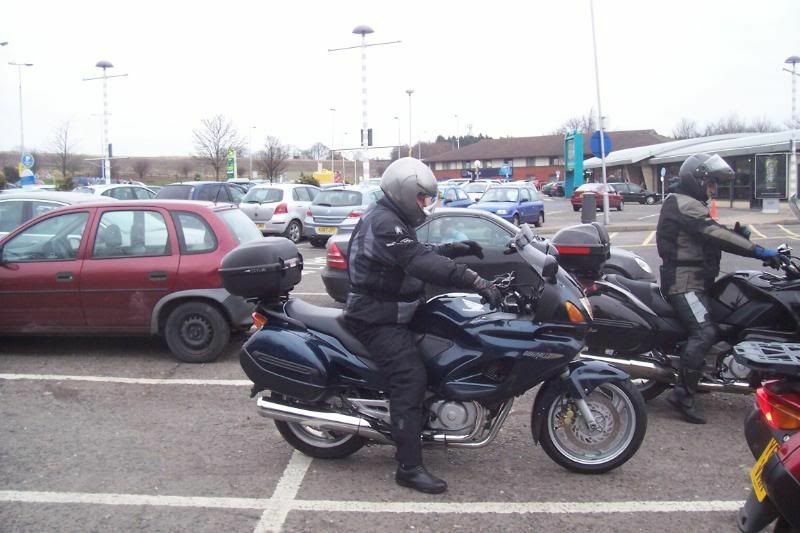 parking up at Trowell Services (M1) in 2008. Previous to my Honda XL700VA-A Transalp this was my ride, a 650cc Honda Deauville. Links in the left side barwill take you to pictures of the bike. * A front fenda extenda. Shortly after taking ownership I replaced the really terrible Michelin Macadams (OEM fitment) with Avon Azaros (AV45 / AV46) which transformed the handling and provided confidence inspiring grip when riding, especially in the wet. * A power socket for charging mobile phone or running a gps sat nav unit. * Small electric air compressor to inflate tyres. * Soften up the rear suspension from the rock hard standard setting so that I could get feet flat on the ground and a more comfortable ride. * Rotate the handlebars back a tad to improve the riding position. A Blue Media sat nav unit. Originally purchased by a member of the family this unit is running the Navigon v4 software. It is rubbish! Puts you in the righthand lane on the entry to roundabouts to then tell you to "take the first exit left". Tells you to "prepare for a roundabout in 400 yards" when you can see the road is dead straight for over a mile. And it ALWAYS throws a wrong turn followed by a U turn at the QMC roundabout in Nottingham... . . . Boy - did I hate that unit! However, my family generously got together and my 2009 Christmas present was a Garmin 255W with a Ram Mount and AquaBox 6. In May 2011 I supplemented this set-up with a Garmin 1490T sat nav unit. Both have full European maps, both are car units, the 255W is good point to point with one way-point while the 1490T allows me to plot or import custom routes. The Ram Mount is easy to fit and the AquaBox keeps whichever unit I'm using nice and dry, while ensuring it can still be used - and I have few problems with motorcycle gloved hands. It may not be as good as a bespoke motorcycle units as it doesn't have a "motorcyclist" program but both will get one to an unfamiliar location, the 1490T will let me to plot specific routes and both will get you where you want to go, or, get you home if you are lost. I'm quite happy with the set-uo. I bought the Deauville, trading in the Triumph Sprint at Stratstone Motorcycles, Claycross, Derbyshire. Bought with 3,249 miles recorded it has now covered over 27,000 miles. One of the first upgrades was to replace the Michelin Macadam tyres with Avon Azaros, which have in turn been replaced with Avon ST Storms - Avons really suit the Deauville. Additionally I've upgraded the battery to a higher output one, the YTZ14S-BS which gives it a healthier kick when starting and should last a nice long time. Problems, not many really... the front brakes siezed on the week before it was due it's 16k service. On the 3rd attempt I got them freed off, cleaned, greased and re-assembled with new pads so that I could ride it down to The Motorcycle Workshop, London Road, Derby where they checked my handy work, took care of the rest of the service and fitted new tyres, this time the Avon ST Storms (Avon’s replacement for the Azaros). Other than that and oil & filter changes (which I do every 4,000 miles) all I've done is ride and clean it. It is regularly used to commute on and at other times I've toured; Rennese in Holland in 2006 and Southern Ireland in 2007. There have been ride-outs with the Deauville Owners up to Durham, round Dalby Forest, again up to Scarborough, down to Rochester & Rye on the south coast and round Derbyshire and the Snake Pass, basically all over. While I don't ride for economy reasons I do keep a log that tells me that over those miles I've averaged 55mpg and had a smile on my face practically all of the time. Together we have survived the torrential downpour that lasted from Fishguard to Derby (via Aberystwyth and Shrewsbury, on the return journey from The Republic of Ireland trip) and pissed off many a motorist with my making progress style of riding, and the story is far from over. I have a feeling that this partnership is going to last a very long time. It's just had it's 10th birthday and we've been together for over 5 years. The standard exhaust was looking tatty and a new Honda exhaust (without the downpipes) is over £582, so I struck lucky when I got a complete, fully stainless, Motad system from a dealer in Kent selling on eBay for £260 including p&p. The only things missing were the exhaust gaskets which I sourced and purchased seperately from Bob Minion, my local Honda dealer. Removal and fitting was straight forward using simple tools - 1/4 inch socket drive with long reach being the essential tool. Not only does the end result look good, it's lighter too, as the complete Motad system is lighter than the standard exhaust box on it's own. It also makes the the Deauville sound like a V-twin and less like a newted sewing machine. To celebrate it's 10th year since first registration we've just dome the 2011 DmD meet. Leaving Derby at 07:50 on Saturday 18th June I set off for Folkestone and the Channel Tunnel, through to Calais, disembark and head down the coast to Berck, where I hit the Autoroute to Amiens for my first night's accomodation (all accomodation prebooked via the internet). Next morning I set off for Challons-en-Champagne and met up with Jonathan for lunch before riding on together to Verdun, Monday we rode to Saint Die in the Vosges and Tuesday we completed the ride to Riegel via Nuef Brisac. Wednesday was registration day, so we did, then in the afternoon we visited the Maginot Line just 20km away. Thursday was 190km in the Vosges, Friday 160km in the central Black Forest, Saturday 180km in the south of the Black Forest. Sunday was an early start, leaving Riegel at 07:15 with Steve who was heading for Dartford I arrived back in Derby at 18:45 having ridden 695 miles in the day (1118km) and 1808 miles (3054km) since leaving home. In that time I got soaked through 6 times (must get some better gear), had an unintended off-road excursion on a switchback in the Central Black Forest and had a thoroughly good time. And the bikes has now covered 40,700 miles - not bad for a "dull" bike. The Deauville has gone to a new home with Peter in Swansea and I'm glad to hear that he is really pleased with both the bike and the deal we struck. It was a horrible wet and windy day when he rolled up with a friend to view the bike - which was all he could do in those attrocious conditions. We tied it down on the bike trailer and away it went. In the end I had covered just over 40,000 miles in a little over 7 years, the mileometer reading 43,996 when it left me. With the help of forum members it never managed to stand me at the side of the road for more than an hour, and that was a puncture so not really the bike's fault. At an average of 54.9mpg on supermarket unleaded it was cheap enough to run. Insurance was rarely more than £125 per annum for Fully Comp and tyres lasted well at 10 - 12k for rears and 12 - 15k for fronts and I stayed loyal to Avon for the duration. The press just didn't understand the bike when it was launched and labelled it The Dullsville, and it was a label that stuck, mainly due to 3 factors. The first was because back in 1998 when it was launched the UK motorcycling press at the time had a habit of sending one journalist to a bike launch and then the rest simply regurgitated that original review. 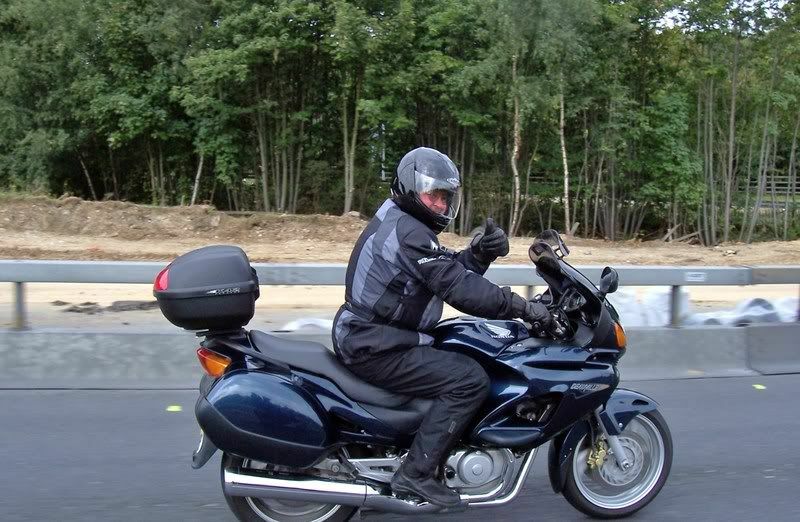 The second was that it was a niche motorcycle without a competitor or a rival for comparison (in a niche which Honda have now abandoned just as others start to fill it with middle weight tourers like the BMW 800GT). Thirdly, those horrible, OEM Macadam tyres. But it was much better than that tag suggested. It always started on the button, needed minimal maintenance (4,000 mile oil changes aside) and gave decent weather protection, performance and road holding (once you'd ditched the Macadams). I was sad to see it go, and sometimes regret that decision to sell. It was a bike from the era of carburettors and simplicity, before the later bikes with Combined (linked) braking (from 2002), C-ABS and fuel injection (2006). Because the press didn't originally like it Honda didn't know what to do with it and it suffered from lack of development, eventually petering out and passing into history at the end of 2012 when Honda quietly deleted it from their model line-up.